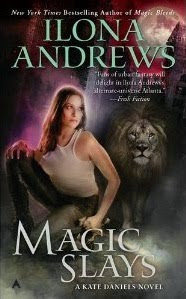 Magic Slays by Ilona Andrews was one of those highly anticipated books for me. The great part about finally reading it? It wasn't a disappointment. This is the fifth book of the Kate Daniels series and so far there's not one loser in the bunch. Changes seem to be the main focus in Magic Slays. Everyone is going through changes in this story, Kate, Curran, the Pack, Andrea, Julie and even the Magical community as a whole. Kate is learning how to navigate her new role as the Alpha's Consort within the Pack, worrying about Julie who ran away from school, adapting to her new, intimate relationship with Curran, while simultaneously trying to make a go of her new PI business. The phones are not ringing, Julie is missing in action, the Pack is acting out and Curran... well, he's being his Royal Fussiness. Magic Slays seems to be a transitional book in this series. Kate, Curran and the rest of our favorite characters are still battling evil, however the quick pace and high volume action is not there, at least not in the beginning. The end result is that there's a slower pace to Magic Slays that doesn't immediately grab the reader as previous installments have in the past, and the overall plot isn't as compelling as those in the previous books where the mythology-based components were more complex. However, that's not to say that this is not a great read, it is. And although not gripping, the resolution to the overall plot is as well done as expected. 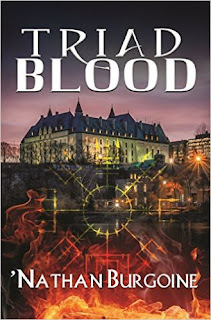 Kate is still Kate, and she gets into all kinds of trouble after she and Andrea are hired to investigate their first case which by the way has nothing to do with vampires. The Red Guard hires them to find one missing inventor, but soon they realize he's not the real problem, it's the invention he created and the devastation it can bring to Atlanta. He must be found, but most importantly the device must be destroyed before it's too late. While all this is going on, Kate finds out that her role as the Alpha's mate interferes even with her new business. Whether it's dealing with magical or human beings, she must follow protocol, and there are consequences for those who mess with her. Curran tends to take an attack on his mate personally... it's not business to him, it's personal. I began to worry about Kate after a while and how all this interference from the Pack, and all this new protocol she has to follow, would curtail her activities as a PI and well... with kickass Kate. No worries though... she handles it pretty well. Not only do I love the way she and Andrea work together as partners in Cutting Edge with all that snark and banter, but Kate and Curran also make an awesome team as the Royal Alpha intimidators. Kate is still her snarky, kickass self. I love the fact that the Andrews writing team continues to develop this character. A character that has grown emotionally in leaps and bounds since that first book so that by now she's learned how to take the risk of loving others and making them a part of her life. In this story that part of Kate's character development is kicked up a notch. In Magic Slays, there are important revelations about Kate's background and past that contribute to that continuing growth and that will surely affect her future. Some of the most emotional moments come from the deep sense of betrayal Kate experiences by some of those revelations. They not only affect how she views herself and her past, but also her present relationship with Curran, and eventually how she reacts to Julie's precarious situation in this story. Kate and Curran, well... their courtship might be over, but they still have much to discover about each other. No worries, though, Curran is still sigh worthy and the sizzle between these two is still there. There's quite a bit of warmth to Magic Slays even with all the action, angst, blood and guts. I usually devour these books in one sitting and later find myself going back to look for the details, this time it took me a while to finish the book. Fortunately, the fact that this book has a slower pace allowed me the time to sit back and enjoy it all the more. It was an interesting trade off. However, I think this is just the calm before the storm -- especially after the ending -- and as always that next book is just as highly anticipated as the last one. I find myself more and more engrossed and entertained by these characters. Loved how with this story, the seemingly disparate dots of the mystery melded together to the reveal the whodunnit. The humor continues to crack me up, and I REALLY enjoy watching Kate and Curran's relationship develop. They're mated now, but that certainly doesn't mean that they are in accord on all things, and it's great seeing the give-and-take between them. It's not just physical (or even emotional) attraction that holds them together: it's power, and the ability of each to contribute power to their partnership and hold up his/her end of the bargain. The weakness for me in this book was in the first chapter. The prologue was great, but then Chapter One had a stilted tone that didn't pull me in. But as soon as all hell started to break loose, the writing smoothed out. Ilona Andrews is fast becoming my go-to author who never disappoints. I didn't realize that Andrea went with Kate - YAH! I love Andrea! And his Royal Fussiness - LOL! Ilona Andrews is definitely one my go to authors, and this is my favorite urban fantasy series to date. I not only love the cast of characters and the way the relationships have been developed throughout the series, but I agree with you in that they do an outstanding job of pulling together well-researched intricate plotting in the process. Sonia, I agree. Magic Bleeds was also my favorite book of 2010, but this was a solid read for me with lots of positives, so I was not disappointed. I specially liked that Kate's character and the relationship between Kate & Curran continue to grow at this point in the series. Still need to read this, good to know ahead of time that it starts a little slow. I was hoping we'd get more of Kate's background. We know so little this far into the series that it was about time for some info. Leslie, there are some good details in this book about Kate. I think the next book should be even better in that respect. I can't wait to read it... so there's the anticipation factor for me, again. LOL! I agree Nath, I liked the way Kate's past and her emotional reactions were handled. That ending really was great, it certainly made want the next book pronto. Now that I've caught up with Nalini's Psy-Changeling series, maybe this one should be next! I'm actually not so far behind, which is good. I love the tension and action in this series... am so glad to see it still holding your attention so well. I'm sure I will catch up soon. The last one I read was Magic Stikes, so I'm not too far behind. I do remember being on the edge of my seat for that whole book! And the tension between Kate and Curran was SO much fun.